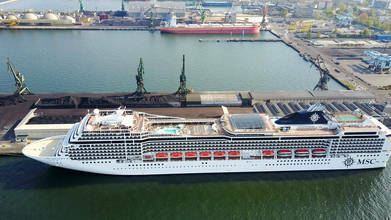 Krecik Turbo used a DJI Mavic Pro drone to create this aerial of a cruise ship docked in the Baltic Sea port of Gdynia, Poland. It's the second largest city in the Pomerania region after Gdansk, which lies to its south. It's located on the western shores of the Bay of Gdansk, just south of the area which is partly divided from the rest of the bay by the Hel Peninsula. Gdynia is a significant leisure travel destination and an important port for cruise ships plying the waters of the Baltic.